Off Road near US Highway 395. Yep, Olancha has some OHV (off-road) areas near the dunes, but this web site is dedicated to the real deal, the scenery, the trail heads, the hot springs, great secluded camping & of course, back road exploring. You will need a Inyo National Forest map to discover these back roads. These are minimally traveled routes, un-maintained, sometimes washed out, eroded & maybe even creek crossings (without a bridge). Some gravel two-lane routes, some one lane roads leading deep into dead end canyons. A few popular routes are paved, but most of these listed are indeed dirt roads. Some may require high clearance vehicle, or even 4×4. Know your vehicles limitations & be prepared to turn back when the road worsens. Cuz more often than not, it’s a sign of what more difficult terrain is to come. Watch out for live stock – they are dumber than they look. Owenyo Rd – Wanna parallel the highway (395) on dirt; Sure, it’s a long bumpy route – from Hwy 136 @ Dolomite to Bend City @ Mazourka Cyn. Road# 13S05 – Mazourka Canyon Rd – leads up to some old mining camps & way behind Mazourka Peak (9410′) deep into the Inyo mountains. It’s all desert on this side, but these canyons have pinyons & more vegetation than you would imagine. Road# 9S15 & 9S14 circle Andrews Mountain (9460′) then join back up w/ Death Valley Rd (the North Pass into Saline Valley). This wide road leads out to multiple dirt roads that peel off in every direction. Many Eastern Sierra Hot Springs can be found out here – on the east side of the highway. 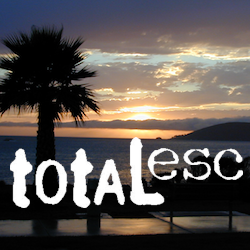 No hot spring resorts, no facilities, no clothing & very primitive. Coyote Wash leads up to Coyote Flat & out to Coyote Lake. 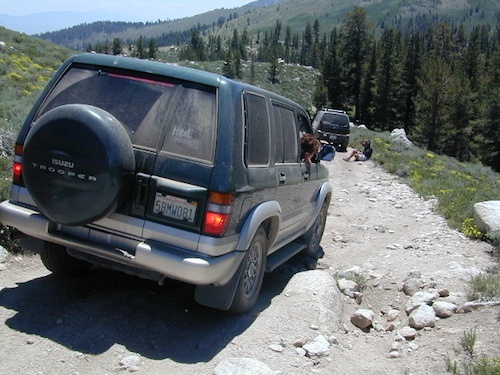 This a a spectacular high altitude plateau overlooks the Owens Valley & requires 4 wheel drive just to get up there. Pinyons, junipers, aspens, wildflower meadows, old mines, & yes, lakes at 11,000′ elevation. Views of the High Sierra & South Lake. Buttermilk Road – This dirt road is north turn off of Hwy 168, W of Bishop, CA. “The Buttermilks” are a popular spot among rock climbers. A great place for indian petroglyphs too! Horseshoe Meadows Rd – Paved route with great views over Owens dry lake bed; access via Lone Pine CA; A nice day trip to meadows & High Sierra scenery. Picnic & day hike! McMurray Meadows Rd – south off of Glacier Lodge Rd (#9S21) just W of Big Pine CA. You can find ancient cinder cone volcanoes & cave-like lava tubes in between this long dirt road & the highway. Monache Meadows is a high elevation meadow that takes some time & determination to get to. 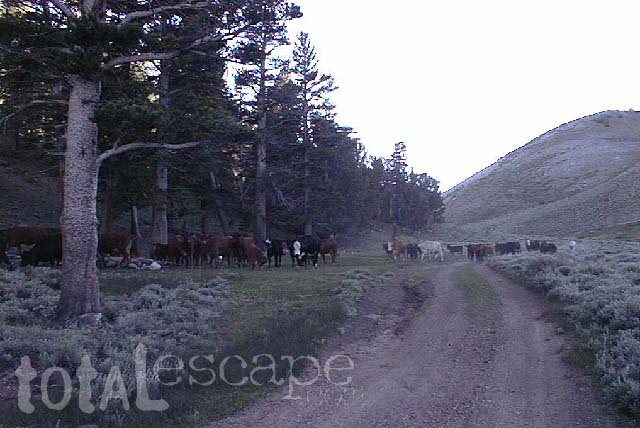 This area is part of the Inyo National Forest, but can be accessed by either: backpacking thru the high Sierra’s or driving a high clearance vehicle thru Sequoia NF # 22S05 Sherman Pass Road, behind the Black Rock Ranger Station & Troy Meadows Campground. High clearance is needed, 4×4 maybe. Great camping sites near Olancha Peak trailhead. The area is surrounded by Golden Trout Wilderness & South Sierra Wilderness. From US Highway 395 to Kennedy Mdws & then Monache is a full day of exploring, so you may as well stay the night up there. But bring warm gear, a campfire permit & a capable vehicle. 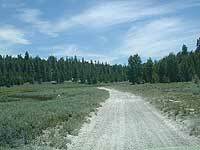 Manzanar Routes – Back behind Manzanar Camp there are miles of dirt roads to explore. Many creeks side camp sites can be found even with a passenger car. Small trees & sage brush. Secluded camping (for free) is possible in the Eastern Sierra. Mono Craters (Rd# 1N11) – the youngest mountain range on the continent. Just south of Mono Lake, this route skirts the pumice cones & climbs over the Aeolian Buttes, before it meets back up with Hwy 395. Walker Creek Rd #19S01 – Oaks & creek. South of Olancha CA, look for turn off & follow dirt road up into the tight canyon. Road# 4S02 – Owens Gorge Road – N of Bishop behind Lake Crowley. Camping w/ boulders & pines. Good open sky views for stargazing. Road# 1S63 – June Lake Loop is CA SR 158 (Hwy 158) paved main route, which is often closed for winter months, due to deep snow. 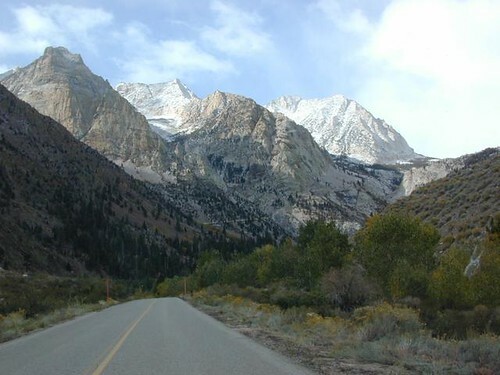 Road# 1N17 North of June Lake Loop; dirt road access to Parker Lakes & Walker Lake trailheads; Side canyon routes offer (unmarked) picnic areas and fishing spots; few primitive camping options.